“Equality and diversity has moved from a tickbox exercise to be embedded within the culture – it doesn’t feel like an added extra any more”. 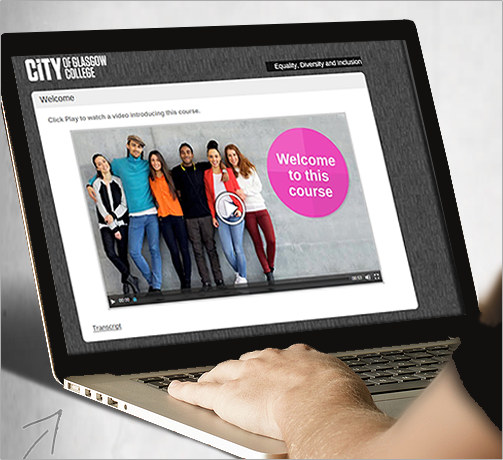 In 2014, Marshall E-Learning developed a mobile responsive Equality and Diversity course for Glasgow City College. The course was commissioned as part of Glasgow City College’s ongoing commitment to counter issues of racism, sexism and unconscious bias amongst the student and staff population. With many universities around the UK seeking to tackle this issue, Equality and Diversity training is in strong demand. But the ability to reach an increasingly time pressured and geographically diverse group of learners was going to be an issue. To counter this, Marshall’s designed a mobile responsive course that could be accessed via the university’s Virtual Learning Environment from any location. This meant that more students including distance learners could access the course as well as fulfill the university’s criteria for accessibility and digitisation. Ensuring that the course could reach as large an audience as possible, the app was designed to be compatible with all platforms whether they’re an iPhone, Android or Windows device. Since its launch the Equality and Diversity course has been taken by over 2500 registered students. To date, the feedback from students has shown that the course has been “very well received” prompting the college to measure the impact of the training in the months ahead. “The emphasis placed by the college on diversity and equality issues has a positive influence on staff, with staff identifying that this impacts positively on learning and teaching “every day, and in every lesson”. Staff and learners also appreciated the personal and curricular benefits of working and learning within a very diverse environment. The diversity of the college environment and the focus on equalities good practice has had a significant impact on the culture of the college. “Whilst other companies provide similar packages, I was delighted by the level of customisation and localisation available from Marshall E-Learning. Indeed, we were able to incorporate images and reference to policy, values, behaviours and services specific to our college, together with a Scottish voice-over. Subsequently, rather than adopting a generic, off-the-shelf product, Marshall ACM has created a real feeling of ownership through designing a college specific branded package aimed at students. Graeme Brewster, City of Glasgow College Diversity & Equalities Manager. Take a look at Marshall E-Learning’s Equality and Diversity courses or contact us to find out more about how we can help fulfil your training and development needs.